San Diego area schools may soon be distributing the H1N1 vaccine. About half the school districts in the county, including the largest San Diego Unified, are currently in talks with the Health Department about moving forward with school based clinics. The problem is that no one seems to know exactly when and how much vaccine will arrive. Kids are among the most vulnerable when it comes to contracting swine flu, according to Mark Sawyer, M.D. of Rady's Children's Hospital. He believes it just makes sense to offer immunizations on school campuses. "Everybody is there and kids in school are all in the appropriate age group to get the H1N1 vaccine," Sawyer said. According to Jim Esterbrooks the spokesperson for the county's office of education, the health department is working with 20 of the 42 districts in the county, but no agreements have been finalized. With the vaccine so far in high demand, most parents and grandparents we talked with seemed to think the option was a good thing. But,some say it won't change their decisions on whether to get their kids immunized. "I sort of think that the virus is going to gain momentum, and we'd rather have it now than after it gets stronger, if we're gonna get it," said Pacific Beach resident Maile Busby. As part of the school based immunization programs there will be information for parents so they can make a decision about having their own child immunized. "The bottom line for me is this vaccine is very safe, very effective, said Lee Carlson of Point Loma. "All school aged kids should be getting it." It'll be next month at the earliest before districts can set up campus clinics. Spokespersons from the San Diego Unified District and Chula Vista Elementary District both said they can't plan logistics until they have reliable numbers of the availability of the vaccine. 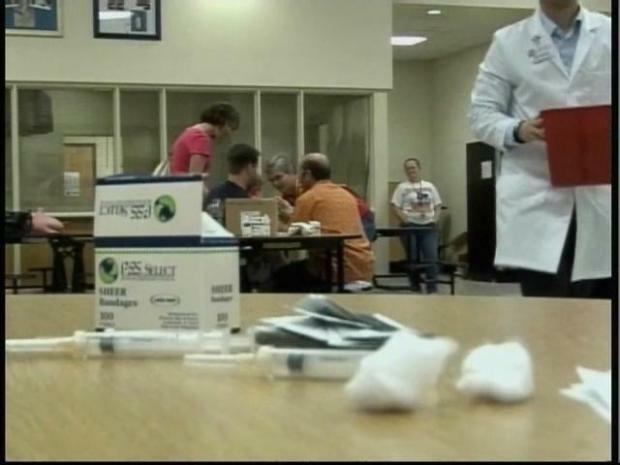 People continued to flock to county health centers Wednesday for the vaccine. More than 21,000 people received the vaccine in just the past few days. There's a limited supply of the H1N1 vaccine here in San Diego and some are questioning whether people who are not considered a top priority have been getting vaccinated instead of those who need it most. County health officials are reminding everyone that they're only administering doses to high-risk individuals. "A person could be a household contact with a child of less than 6 months we don't ask them to bring the infant with them. If someone's pregnant, if they're not obviously pregnant, we don't ask them for a pregnancy test," said Wilma Wooten, M.D., M.P.H. with San Diego County Health & Human Services Agency. "So we are asking people to be patient. Not to make assumptions that people that are in lines shouldn't be getting the vaccine." At local public health clinics, workers are constantly trying to count the nasal spray and shots to make sure the right vaccine got to the right people Wooten said. At this rate, the U.S. may actually meet its goal of 28 million doses by the end of the month, according to the Centers for Disease Control. Additional vaccine shipments to private providers are expected in the coming weeks and to county health centers over the next several months. First-priority will be given to pregnant women, children between 2 and 18 eyars without chronic medical conditions and healthy caregivers of infants less than six months old.